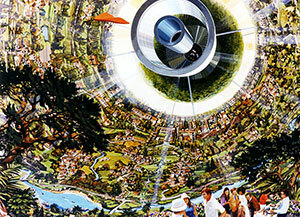 In 1974, Princeton physicist Gerard O’Neill proposed the construction of orbital space settlements. 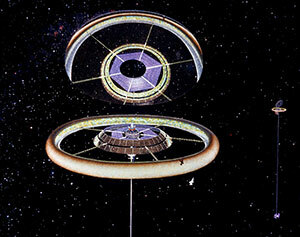 An orbital settlement (sometimes called an “O’Neill Colony”) is a giant rotating spacecraft, large enough and rotating fast enough so that people standing on the inner surface would experience a centrifugal force equivalent to gravity on the surface of the Earth. Thus, children on orbital space settlements would be raised in Earth-normal gravity, which is important for normal bone and muscle development. Since orbital space settlements must rotate, only a few basic shapes work well: sphere, torus, cylinder, or some combination. 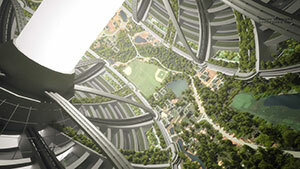 Current materials are strong enough for habitats many kilometers in extent, big enough for a moderately large city. The inner surface of the hull is real estate, i.e., land on which crops could be grown and homes constructed. 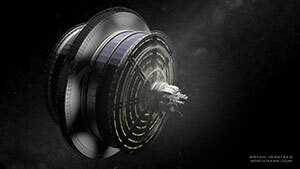 While the outer hull will experience one gravity, interior structures can be positioned for fractional gravity, and even zero gravity at the axis of rotation. People and their families can live there indefinitely, in communities ranging in size from villages to cities which have their own internal economies as well as external imports and exports. 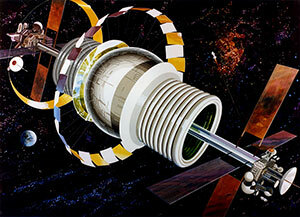 The International Space Station and other space stations are today’s small precursors of later large orbital settlements. 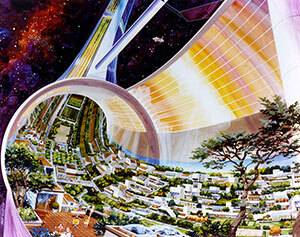 Tourism hotels in space may be the next step, followed by low-gravity retirement homes. These activities would develop much of the technology and infrastructure for people to live well and work effectively in space. 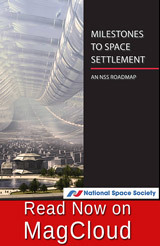 As with any space settlement, radiation shielding will be required. Unlike Lunar or Martian surface settlements, radiation shielding is required on all sides, so roughly twice as much shielding mass is necessary. 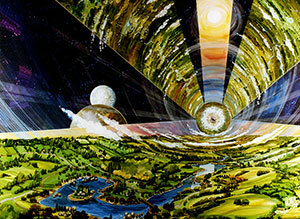 Habitats could be built in, or moved to, a variety of orbits. Most of these orbits would be selected to have 24/7 solar energy available. 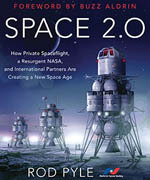 The choice of orbit may be driven by access to materials. Lunar material could be launched into space using electromagnetic launchers (mass drivers). 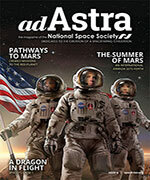 Asteroid material could be utilized either in an orbit close to the asteroid or moved to some other desired location. There are thousands of candidate asteroids among the Near Earth Objects, some requiring less energy to reach than the Moon. The first flourishing orbital habitat would mark another Milestone in humankind’s development, growth, and expansion into the universe. 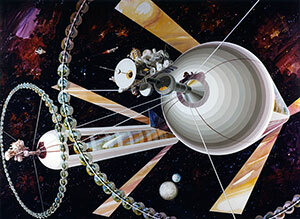 Eventually such cities in space could be located throughout the solar system, orbiting around planets or moons, co-orbiting with asteroids, at LaGrange points, or in solar orbit. These settlements may be very different from each other, each reflecting the particular tastes and cultures of those who built, financed and settled it. Such diversity could provide a new flowering of human creativity. The result would also be to disperse humankind throughout the solar system, enabling survival even if some disaster were to befall the Earth. 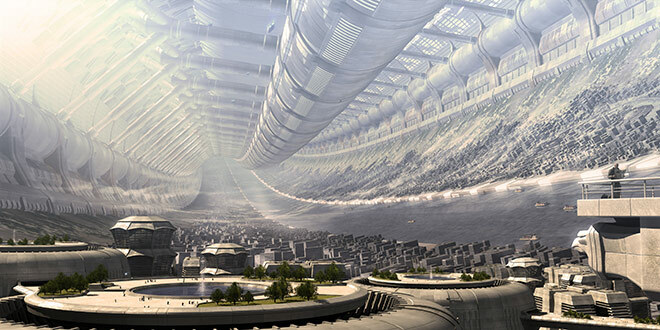 Another Milestone in space settlement will eventually be reached when the population in space exceeds that on Earth.